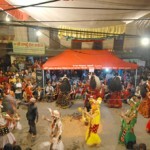 Of the different festivals of Nepal, there are many festivals celebrated throughout the year inside Kathmandu valley. One day its in Kathmandu the next day some other festival in Patan or Bhaktpaur. Likewise, the Seto Macchindranath chariot pulling is one festival which draws scores of people. Seto Macchindranath or Janabaha Dyo chariot pulling festival is one of the biggest festivals celebrated in Kathmandu city. This festival brings together families to experience the chariot pulling. 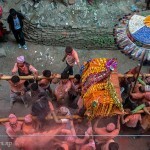 There is a similar Rato Macchindranath chariot pulling festival is Patan. The chariot is made of wood only an is made my craftsmen using wooden materials only. There are no use of nails to join the different parts of the chariot. This is an ancient practice and the tradition of chariot building still follows the old tradition. The chariot of seto Macchindra is pulled from Tindhara near Ghantaghar to Lagan tole. This festival starts on the day of Ram Nawami and is celebrated for 5 consecutive days. 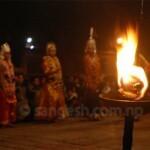 Here are some of the photographs I took recently at jaidewal and lagan of this festival celebrated in Nepal.